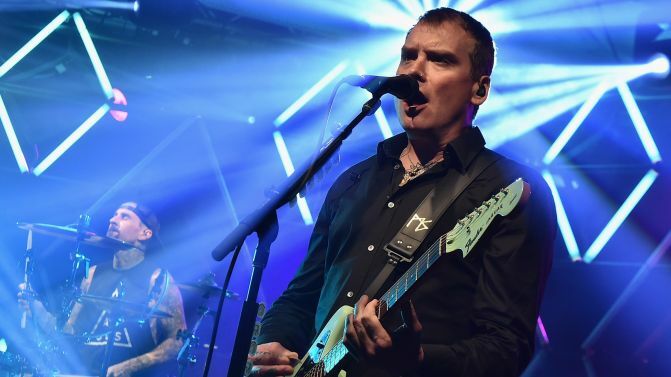 Blink-182 guitarist Matt Skiba has uploaded a short clip of himself trying to nail down a Linkin Park riff ahead of this weekend’s big all-star tribute concert to Chester Bennington. “Learning some @linkinpark tunes with my guitar guru @dannylohner for the upcoming event at Hollywood Bowl w @blink182 and lots of other artists in honor and in loving memory of our buddy Chester,” the Alkaline Trio axeman posted on Instagram, alongside the clip of himself doing what every other aspiring muso does when learning a new song, sitting down on his couch with the acoustic and trying to nut the riff out out note-for-note. As for what riff he’s playing, it sounds like it could potentially be LP’s Minutes To Midnight ballad ‘Valentines Day’ (although some fans have suggested it could be ‘What I’ve Done’ in a different key). ICYMI: the ‘Linkin Park And Friends Celebrate Life In Honour Of Chester Bennington’ concert — featuring members of Korn, System Of A Down, Bring me The Horizon, Avenged Sevenfold and loads more — will be streaming live and for free on the internet this Saturday from 1.45pm AEDT. The sold-out show will mark Linkin Park’s first performance since their frontman’s tragic passing, and all proceeds will go to Music for Relief’s One More Light Fund, in memory of Chester.